The famous rich, volcanic soil of Hokkaido Island is renowned for producing the most nutritious, delicious and medicinal beans in the world. Hokkaido beans are cultivated in the mud banks between the paddies and are harvested after the rice. This special environment of northern Japan makes them beautifully uniform in size and smooth skinned, full and shiny in color. Beans are seeds that grow inside pods and after harvesting only the Hokkaido beans are still hand selected for premium quality. The Mitoku Hokkaido beans we import are grown by a small family farm that has been dedicated to sustainable agriculture for many generations, however they are not certified organic as they are too small to incur the cost of official international organic certification. Since ancient times, azuki beans have been prized not only for their delectable taste, but also for their use in traditional oriental folk medicine. Hokkaido azuki bean juice, (the liquid in the pot from long-term cooking) is very beneficial for the kidneys and years ago literally saved my father’s life. It is rich tasting and delicious. Although there are many varieties of azuki, those grown in Hokkaido are prized above all others for their superb flavor and quality. In soups, entrées, salads and side dishes, these beautiful red beans are the jewels of Japanese cuisine. Mitoku Hokkaido Kuromame (“kuro” meaning black and “mame” meaning bean), translates to black beans but are actually black soybeans and are perfectly round and shiny. They have a strong, delicious taste and energy. For some time, they have been used medicinally to help discharge animal toxins from the body and strengthen female ovaries. Perhaps a more common use in Japan is when mothers wish to see their children’s voices clear and strong during choir they cook them kuromame. 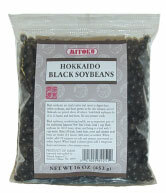 Mitoku Hokkaido Black Soybeans are selected by hand for optimal, premium quality. 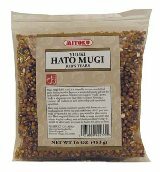 Mitoku Yuuki Hato Mugi Grain Hato Mugi (Japanese Job’s Tears) is one of the world’s oldest grains and has been cultivated for thousands of years in both the East and West. It was the staple of Egypt under the pharaohs, ancient Greece and Rome, the Holy Land during Biblical times and Tibet. This heirloom barley is chewy, extremely easy to digest, and nourishing. In the Far East hato mugi is traditionally eaten to dissolve excess protein and fat from animal food consumption and to clean up blemishes of the skin. Hato Mugi is often times marketed under the name Pearl Barley, but should not be confused with pearled barley, which is regular barley that has been partially milled. 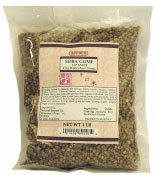 Soba Gome or tiny Japanese buckwheat groats are freshly hulled by Sakurai, the famous family noodle company, Mitoku Soba Gome is a special variety of Japanese wild buckwheat groats. These tiny groats cook more quickly than regular buckwheat and have a mild flavor. Soba Gome is also less robust, nicely soft and fluffy with a subtle earthy flavor.